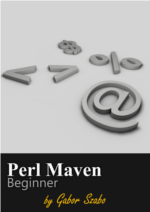 How to insert an array into another array in Perl? Given an array called @names = qw(Foo Bar Baz); and another array called my @languages = qw(Perl Python Ruby PHP); how can the @languages array be inserted in the "middle" of the @names array? Of course I think the "middle" only means - "somewhere" and not that "the same distance from the beginning and from the end", but we have another issue with the task. There can be two types of insertions. Flattening, when the elements of @language become elements of @names, and thus at the end of the operation @names will have 7 elements; or it can be non-flattening, that will create a sort-of two-dimensional array. In this case @names will have 4 elements after the operation, one of them is a reference to an internal array that holds the elements of @languages. The difference in the two code snippets is that in the first one we insert @languages and in the second one we insert \@languages. Note the leading backslash. in which we can reach the values of the inserted array by using the the appropriate index on the main array. Beside one leaving a one-dimensional array behind and the other one creating a two-dimensional array, there is another big difference between the two. What if after inserting the array we change the original @languages array? In the first case, the content of @languages changes but the content of @names remains the same as it was after the call to splice. This happens because in the second case we have copied the reference of the array but now both @languages and $names point to the same location in the memory. So if we change the content of either of those, the other one will change too.